Moulds Gardening Services is available to domestic customers from North Down, Belfast to South Antrim and to commercial customers nationwide. We offer a completely flexible and tailor made maintenance schedule to suit every customers needs. We realise customers want a professional, clean, friendly and reliable service that is uncomplicated, of high quality and competitively priced. 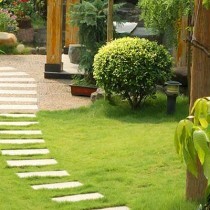 Moulds Gardening Services has modeled itself around these factors to achieve great customer satisfaction. Mulch mowing recycles grass clippings by finely cutting and re-cutting the grass concealing cuttings within the standing grass to wilt and decompose thereby feeding the soil. This can be provided for as little as £1-£2 more than a regular cut. Giving advice . . . Note: Provided all year round though. *All OAP will receive discounts. *All customers requiring continuous work all year round receives discount. Do you own or manage a business? Yes! Then you will want to achieve an advantage over your competitors and have a clean, tidy and professional image that customers are attracted to. Imagine a children’s nursery or a car dealership and the grass and weeds are growing vigorously everywhere and anywhere, along edges, borders and places where you don’t want them to grow. As you can now see it is not attractive or appealing to potential customers, it gives the wrong impression of your business that it is not doing well or it is not of good quality.